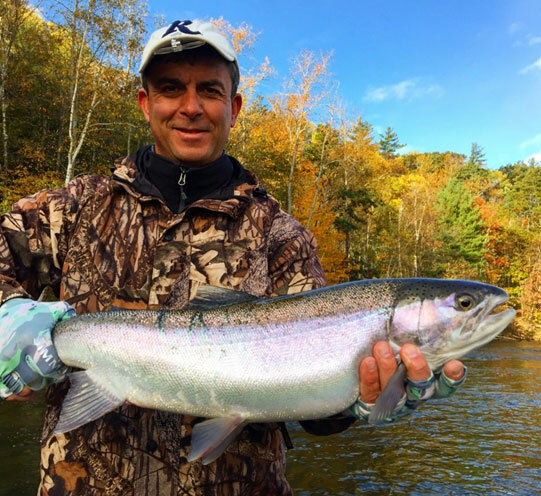 Al Lindner joins Sport Fish Michigan’s Ben Wolfe for Michigan’s Platte River coho salmon run. They discuss Michigan’s incredible fisheries and the broad variety of species and techniques for anglers to enjoy. Michigan has a plethora of fish species to target, and many anglers only target yellow perch through the ice, choosing to target other species during the warmer months. But yellow perch are a tasty panfish that can be successfully targeted and caught year-round. Yellow perch are roamers by nature, most often gathering in schools. They can be here one day, and gone the next, having moved on for no apparent reason. They can congregate in huge schools, eating aggressively as they go. A highly adaptable fish, forage for perch can be extremely varied. Seemingly everything is on the proverbial table as far as forage for perch; round gobies, various minnow species, shiners, crayfish, mayflies, wigglers, scuds, freshwater shrimp, worms and more are all fair game for perch. Thus, tactics for catching Michigan’s perch can be extremely varied as well. Many anglers stick with a typical perch rig with two hooks, either threading live wigglers or minnows onto the hook. This is a tried and true technique, and can often be the ticket to a great day’s catch. Another fantastic option on this perch rig is a piece of cooked shrimp. Some days, the bigger perch really seem to have a preference for wigglers, minnows, or even shrimp. Having all three onboard can pay dividends when the bite gets fussy. The tried and true isn’t always the rule of the day, however, and a variety of other techniques can sometimes lead to an undiscovered bite, or target larger fish. One such technique is a jigging spoon. Not just a winter-time technique fished through the ice, a jigging spoon can often target the biggest fish in the school. There’s something about the erratic flutter, fall and flash that can really trigger big jumbos to bite. Cast and retrieved in a yo-yo lift-fall manner, perch respond very well to this lure. Also, jigged vertically below the boat when the school is directly below can be another great option with jigging spoons. Jonah Jigs in ½ ounce, ¾ ounce or even 1 ounce are what are most commonly on Sport Fish Michigan’s boats when employing this technique. While jigging spoons are not often the best way to target numbers of fish, they can often trigger the biggest in the school, and even call in roaming packs of jumbos. Similar to the jigging spoon is another option most often employed during the ice season – Rapala’s Jigging Rap. Many lures make similar offerings, but Rapala’s Jigging Rap is probably one of the most prolific fish catchers of all time in this category. That being said, there are many other lures in this category that all catch plenty of fish. Moonshine Lures’ Shiver minnow, the Acme Tackle Hyper-glide, Northland’s Puppet minnow, Custom Jigs & Spins Rotating power minnow, and Lunkerhunt’s Straight up are just some lures in this huge category. These options can be fished vertically or horizontally cast and retrieved and at times can lead to fantastic catches of not only perch, but also walleyes that may happen to be in the area. While many waters hold impressive perch populations, some waters have a better tendency to grow true jumbo perch stretching 12 inches or better on a regular basis. Lake Erie has been long established as not only a walleye factory, but also great for perch. Lake St. Clair is another big body of water known for outstanding perching. Further to the north, Saginaw Bay is yet another body of water probably better known for its walleye fishing, yet hosts an impressive perch fishery. Further to the north still is the Grand Traverse Bay area. Here, many inland lakes support a prolific fishery for jumbo perch, and the Grand Traverse Bays are in the midst of a major comeback in perch numbers and size. Towards the tip of the lower peninsula lies Burt Lake, another incredible lake for a variety of species with perch certainly amongst them. Certainly, there is no shortage of spectacular lakes here in Michigan to target yellow perch. From young angler to older angler, they continue to be a crowd pleaser. On the water, and on the ice. Capt. Ben Wolfe shows how Humminbird electronics and Minn Kita trolling motors are key components to success when jigging for salmon. Jigging for lake trout on the Grand Traverse Bays, near Traverse City, in northern Michigan – with Capt. Ben Wolfe of Sport Fish Michigan. We here at Sport Fish Michigan would like to thank all the wonderful customers who graced us with their patronage this past year. We were very fortunate to have had a wonderful year catering to lots of customers across the state fishing for a large variety of species. 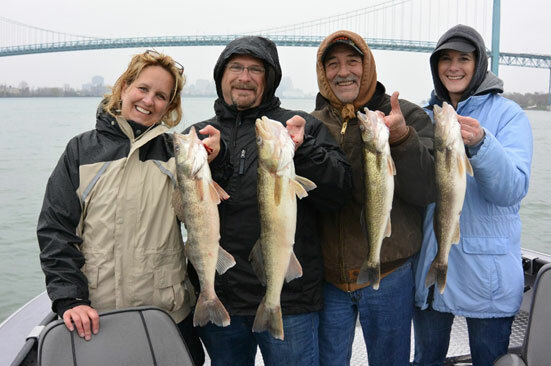 We had another fantastic season fishing for walleyes down on the Detroit River, and once the weather began to cooperate, experienced some tremendous fishing-boating limits for our customers almost every trip. We will be down guiding on this world-class walleye fishery again in April and early May. Our two-Captain system paid dividends again this past spring, allowing for a much smoother experience for our customers. Not only did it help to facilitate anglers’ lines in the water longer, it also meant that we could net fish for our customers-something that other guides often cannot do when the conditions are tricky. We would much rather net our customers fish for them than to have our customers net their own fish. Another benefit of having two Captains is that we were able to pattern the fish that much more quickly-two heads are often better than one! Our steelhead trips went well this past spring, and again in the fall, with some nicer than expected numbers. It seems that the extreme weather that had hurt our steelhead runs the last 2 seasons did not affect this year’s run, and our customers enjoyed some spectacular days on the rivers. The Big Manistee, Muskegon, White, and the Betsie Rivers are where our guides spent the bulk of our Sport Fish Michigan trips. With the much higher numbers of fish that we saw this year, we are excited for 2017, and hope that we will see another great year on the western Michigan rivers. Captains Chad Dilts, Jeff Mallory, Ben Wolfe, Kyle Buck and Guide Scott Kubit are all experienced river guides, and we were thrilled to host not only many new customers, but lots of repeat customers as well! Whether fly fishing or conventional tackle fishing from our drift boats or a custom jet sleds, customers enjoyed great days on the water. Many of our customers got to experience fishing out of Capt. Jeff Mallory’s new Stealthcraft All Terrain boat, and we are excited to also announce that Capt. Jeff is also a Stealthcraft Boats Ambassador. Smallmouth bass trips are a huge mainstay of Sport Fish Michigan’s offerings, and we had a record number of customers plying our world-class Michigan waters. This year saw the inclusion of Capt. Chad Dilts to the full-time roster of bass guides, and Capt. Ron Dohm Jr., as well. These Captains allowed Capt. Ben Wolfe and Traverse City Bass Guide Service to offer even more trips than ever before, and customers were thrilled with the having these Captains to fish with. Ranging from Lake St. Clair to the southeast of Michigan, to Burt and Mullet Lakes to the north, and stretching west to East and West Grand Traverse Bays and the area’s inland lakes, the bass fishing was superb almost all year long. Not only did we have excellent numbers of fish caught, but we also saw a tremendous average size. The fishery here in Michigan for big smallmouths is healthy, and with continued catch and release tactics, we are hopeful to see another banner year in 2017. We are seeing more pressure on our Michigan bass, and it is imperative for the long-term health of the fishery to adhere to safe catch and release practices. These are very slow growing fish, unlike bass in southern waters, and for those seeking a trophy to mount, we ask anglers to please consider a graphite replica. Not only are graphite replicas just as good looking as the real thing, in many instances they are also more practical. The additional huge benefit is the ability to release those trophy smallmouths to swim and thrill another angler another day. Our lake trout season was nothing short of stunning, and we couldn’t have been more excited to see not only the high numbers of lake trout coming aboard, but also the quality. Capt. Adam Collett and Capt. Ron Dohm Jr. worked together as a team aboard the Mega-Bite to clobber not only big numbers of lake trout, but also salmon. The Mega-Bite is what we consider to be the premier charter boat plying the waters of Grand Traverse Bays. Capt. Adam specializes in trolling, and he and Ron put countless customers on some truly awesome fishing. For those that vertical jigged with Sport Fish Michigan, Capt. Chad Dilts and Capt. Ben Wolfe had some equally spectacular fishing. This hands-on technique is a great way to experience these feisty fish for those anglers who prefer to have a rod and reel in-hand. Lots of fish over 10 pounds were boated during these jigging trips, and these Captains knew right where to find the fish. With excellent numbers of lake trout in Grand Traverse Bays and out of the port of Frankfort and Platte Bay, the outlook is looking like we will have another spectacular year in 2017. One of the most fun things we at Sport Fish Michigan began doing this year was to specifically target cisco (lake herring or tulibee). These fish are a relative of the whitefish, and are an outstanding gamefish on rod and reel, are aggressive biters, and are truly awesome to eat. Spring and fall are the prime times to target these fish and that’s exactly when Sport Fish Michigan targeted them. 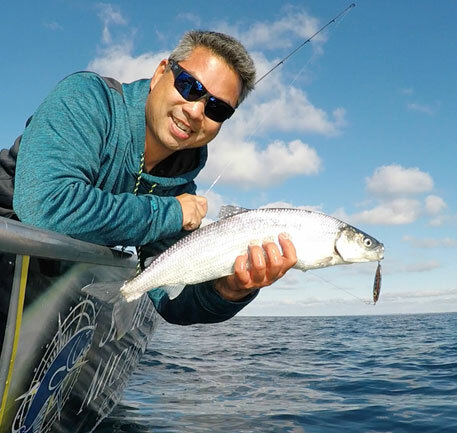 In fact, with such high numbers in Grand Traverse Bays, these may be the perfect fish to target for anglers looking for a fish that pulls hard and doesn’t know when to quit, as well as anglers who just want to boat high numbers of fish. Capt. Ben Wolfe calls them “velociraptors with fins” because they are so aggressive. 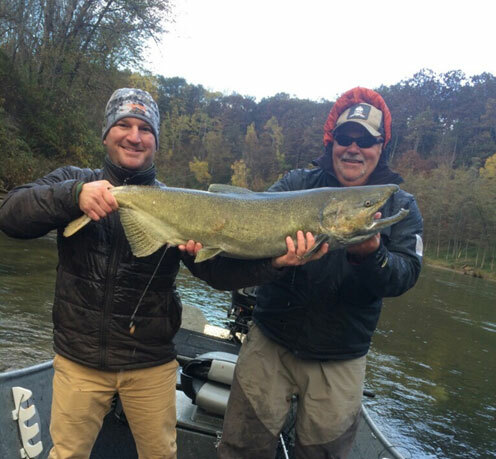 Sport Fish Michigan’s salmon season was exceptional both on the big waters and on the rivers. Grand Traverse Bays, Platte Bays, and Betsie Bays all produced outstanding fishing for king salmon and coho salmon. The area rivers also had equally fantastic fishing, and we are super excited for what next year’s run already. Trolling on the Grand Traverse Bays was great, with high numbers of fish present. Mega-Bite, with Capt. Adam Collett at the helm, was the hot boat on the Bays. Vertical jigging had its share of phenomenal fishing as well on Grand Traverse Bay, Platte Bay, and on Betsie Bay. Both species of Chinook salmon and Coho salmon ran larger than last year, and with much higher numbers-our customers were thrilled with full coolers on many days. Capt. Chad Dilts and Capt. Ben Wolfe were lucky enough to put its customers on fantastic numbers of salmon using this highly effective jigging technique. While some old-school anglers consider this to be a snagging technique, these two Sport Fish Michigan Captains will not only attest to its effectiveness at getting bites, but they take affront to it. They would love nothing more than to show everybody just how potent this technique can be at getting king and coho salmon to bite. Next year’s run is promising to be just as good, although it is an unknown how things will be beyond then. River trips for salmon went extremely well in large part to Capt. Jeff Mallory doing his thing as a premier river guide. He is well versed in not only fly-fishing techniques, but also in conventional tackle. Capt. Jeff is an accomplished fly tyer, and many of his own patterns are on display when he guides. Captains Chad Dilts and Kyle Buck also did a lot of river trips this past fall for salmon, and we are thrilled with the results. 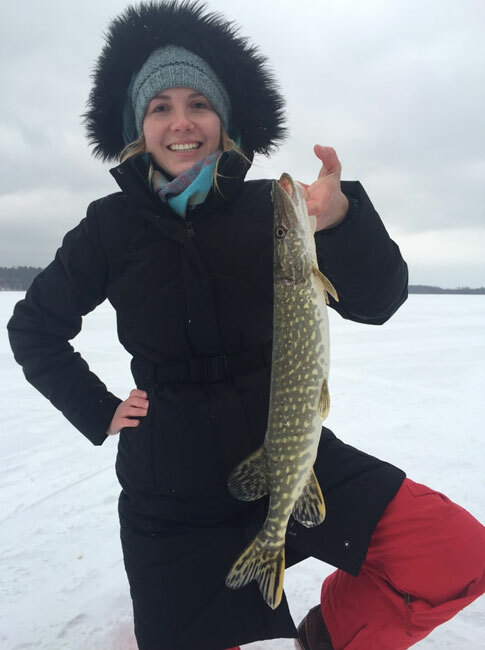 Ice fishing has become a large part of the Sport Fish Michigan business, and there is no slowdown in growth in sight. With customers coming from as far away as Florida, California, Puerto Rico, and even Brazil, we have quickly grown into the largest guided ice fishing operation in Michigan. We are very proud to not just be able to take customers out onto the ice, but to set them up with some of the best equipment in the ice fishing market. Each customer fished from within a heated Otter Outdoors thermal shanty outfitted with Marcum electronics. All the tackle and bait was also provided, meaning that customers had everything necessary for a fun day on the ice. With transportation provided for them as well, we prided ourselves on a top-notch service. For 2017, we are proud and excited to announce that we have partnered with Humminbird, and will be offering our ice customers use of the brand new Humminbird Ice Helix 7 sonar units. These are truly awesome electronics, and we are excited to showcase this to our customers on the ice. These are the best units on the market, and we at Sport Fish Michigan are proud to offer use of these units to our customers. Last winter was warmer than the previous two, and we had to travel quite a lot to stay on the good ice. Fishing for a variety of species, we guided trips for walleye, yellow perch, northern pike, bluegill, crappie, lake trout, and even burbot! 2016 also saw a great partnership with two television shows. Hook n’ Look was sponsored by Sport Fish Michigan again, and in this past year’s television show we fished with Kim Stricker out on Platte Bay for coho salmon. We had a great day on the water fishing for cohos with Kim, as he had the opportunity to experience the thrill of sight fishing for these amazing fish in the crystal-clear waters of Platte Bay. Sport Fish Michigan is once again sponsoring Kim’s show, and in the show that will be airing this coming winter on the Outdoor Channel, Capt. Ben Wolfe fishes alongside of Kim for smallmouth bass. Angling Buzz television show was a new show produced by Lindner Media. The Lindners are icons in the industry, and it was a pleasure being on each of the 13 episodes, giving the state-wide fishing reports every week. While the weather forced us to abandon our hosting and filming with Al Lindner several times in 2016, but we are scheduled for filming two shows next year, in 2017. Sport Fish Michigan is set to sponsor this new and upcoming show again for the new year, and will once again be bringing weekly fishing reports covering the entire state of Michigan. Regular web-published video fishing reports are also going to be featured on the Angling Buzz web site. Anglers looking for an idea of what is biting can tune in or look up the Angling Buzz web site to learn more about what is happening state-wide in Michigan during these timely updates. With so many species to target in the state of Michigan, there never seems to be enough time to be able to target them all. From smallmouth bass to salmon; yellow perch to walleye; lake trout to cisco; whitefish to panfish; steelhead to brown trout, not to mention our awesome musky and trout fishing. So many fish to chase, and so little time to do it-even for us! This is what Sport Fish Michigan is all about-staying on top of the various species of fish throughout the state to give customers the best experience we can. By taking the guesswork out of hiring a Captain or Guide, we aim to provide our customers with the best in the business using the best equipment possible. If our growing business is any indication, we think we are on the right track, and with so many customers coming back as repeat customers, we are confident that we are doing things right. From all of us at Sport Fish Michigan, we extend a very humble and heart-felt thank you. Thank you for a wonderful 2016 season. We look forward to hopefully having the opportunity to fish with all of you in the future. Vertical jigging for salmon in northern Michigan is fun and exciting! 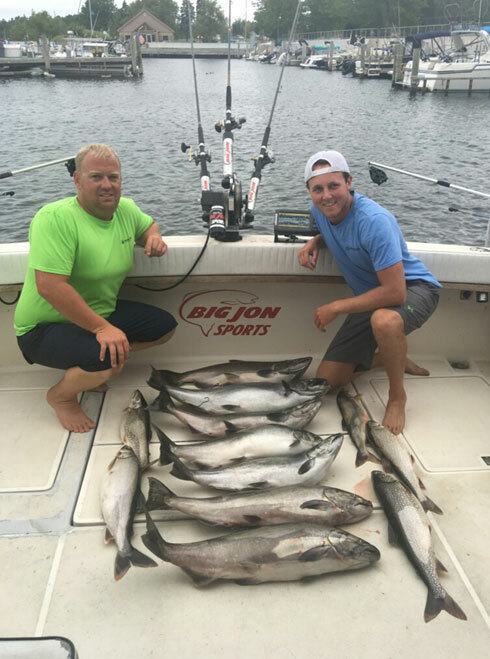 Book your hands-on, light tackle, vertical jigging trip with Sport Fish Michigan to experience the best Michigan fishing. Captain Ben Wolfe demonstrates the use of the Humminbird electronic fish finders when jigging for lake trout in the Grand Traverse Bays, Michigan. Michigan Lake Trout and Salmon fillets are delicious prepared on the grill, in the oven, or pan seared. Learn the differences and similarities between these two fish fillets with Captain Ben Wolfe and Captain Chad Dilts of Sport Fish Michigan. Capt. Ben Wolfe shares tips and tricks for jigging for walleye in the Detroit River. Looking ahead to the 2015 season, we are encouraged by the opportunities that lie ahead for all of our guide services. We have a lot of goals, many things that are inspiring us to push further ahead, and things we want to improve upon. 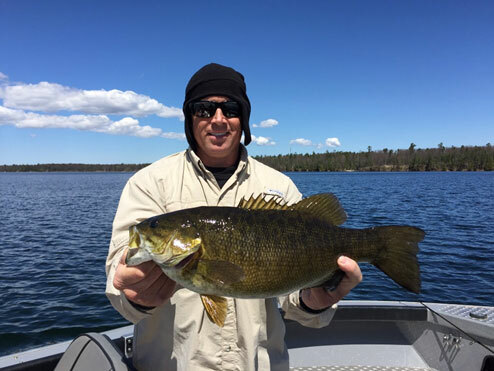 Traverse City Bass Guide Service will be guiding again this year on Grand Traverse Bays as well as many of the potent inland lakes around the Traverse City area in northern Michigan. Bassmaster Magazine ranked the Bays #9 in their rankings of the top 100 Best Bass Fisheries in the World. That’s pretty exciting, especially when 4 out of the 5 lakes mentioned in the rankings were all in northern Michigan! Partnering with a couple of bass guides within the Sport Fish Michigan network of the Michigan’s top Captains and Guides, we can offer trips on each body of water mentioned in the Bassmaster Magazine rankings. Who knows where these lakes will be ranked in 2015 but the future looks incredible, and we are excited for spring to be here so that we can get back out, chasing after smallmouth and largemouth bass. With changes to the Michigan fishing regulations on the horizon, we may even see a change which will allow us to be able to target bass year-round in a catch & release manner. Under the proposed Michigan DNR changes, the open season would remain the same, but we would now be able to target bass all year long when practicing catch and immediate release. Wolfe Outfitters will be entering its second full season as the only permitted outfitter allowed to fish inside the Sleeping Bear Dunes National Lakeshore. What makes this truly exciting is that we are poised to be able to target the outstanding steelhead and brown trout fishery at the mouth of the Platte River in the spring. Steelhead and brown trout can be caught with a variety of techniques including casting, fly fishing, and trolling. Casting minnow baits, like jerkbaits, is a great way to enjoy these feisty fish, and with the gin clear water that Platte Bay has, being able to watch these fish fight and chase offerings is nothing short of awesome. For fly anglers, stripping streamers is every streamer angler’s dream come true, as both browns and steelhead respond well to this technique. Trolling andsa jigging can also pay off handsomely out on Platte Bay. The salmon fishery on Platte Bay is something to behold, and we are hopeful for a great run in 2015. Coho were first stocked in the Platte River by the DNR back in the mid 1960’s, and created the world-class coho fishery that we enjoy today. The bulk of our techniques employ casting and jigging techniques for these awesome fish. We had a lot of customers out on Platte Bay in the Sleeping Bear Dunes National Lakeshore this past fall, and every single person was blown away by not only the incredible fishery on the Bay, but also the scenery. After all, Sleeping Bear Dunes wasn’t named the most Beautiful Places in America by a Good Morning America poll for nothing! Jigging trips went extremely well last year, and we are looking forward to building on that momentum. With the incredible lake trout fishery that the northern Michigan area has to offer, jigging is a truly addictive way to target these fish. With the light bass tackle that we use, anglers get to feel every bump and bite from these aggressive biters, and the fight is heaps more than many anglers have experienced in the past with other techniques. River trips will continue to be a major focus of Wolfe Outfitters and its Guides in 2015, and we are excited about the prospects of not only lots of salmon and steelhead trips, but also about the outstanding smallmouth bass fishery on the Manistee River as well as its trout fishery. The portion of the Manistee River just below Tippy Dam is absolutely spectacular for trout fishing, and this year’s fish will be pushing a very healthy 20 inches by the end of the summer, with many fish well over that mark. We have both Michigan State and Federal permits, including the highly coveted permits for the Manistee National Forest. This gives us access to fish the entirety of the Manistee River, utilizing the Federal launches that many other guide services aren’t able to take advantage of with their customers. While the salmon and steelhead runs were below average, and definitely below what we have become accustomed to, we are excited about the spring steelhead run. With low numbers of steelhead running all of the northern Michigan rivers in the fall, this sets up well for a stellar run in the spring. We are looking forward to targeting these chrome beauties when they enter the area’s rivers. Sport Fish Michigan has grown each year, and we are hopeful that 2015 will be no exception! We are thrilled to have each and every Captain and Guide that we have, and each brings something special to our customers’ trips. From fly fishing to bass fishing, trolling the big lake to river trips, and even ice fishing, we are working hard to offer everything an angler might want around the state. We are once again sponsoring the Hook n’ Look television show on the Outdoor Channel in 2015, and are excited about the national exposure from this popular show. 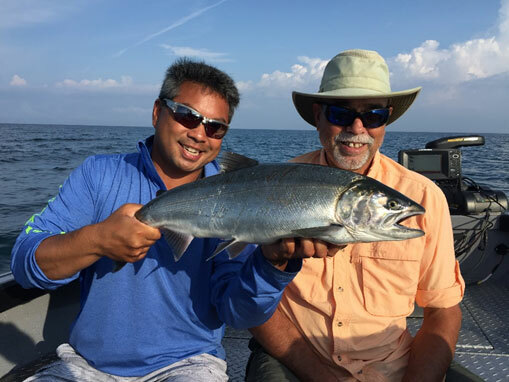 In addition to the Hook n’ Look show, we hope to be able to produce our own videos on a variety of fisheries utilizing our Sport Fish Michigan Captains and Guides. We plan on filming walleye fishing in the spring on the Detroit River. The Detroit River is truly spectacular for walleye fishing in the spring, when these tasty fish run into the river to spawn. We also plan on filming bass fishing with several of our Captains on Lake St. Clair, taking advantage of this world-class bass fishery. Further north, lies the Muskegon River, the Manistee River, Betsie River, and Platte River. All boast stellar steelhead runs, and it is our goal to film some steelhead clips on these rivers fishing with our Guides both with conventional tackle as well as on fly. Atlantic salmon are on the list of species we would like to highlight as well, and Torch Lake just north of Traverse City is host to an impressive population of Atlantics. The super clear water that Torch Lake is known for will make this a treat, as these are a beautiful fish. We are also tremendously excited to be the largest ice fishing operation in Michigan, and are hoping to build upon the successes of last year. Ice fishing is a very popular aspect of fishing, and early indications are that we will be busier than ever. This year, we are planning an inaugural on-ice seminar clinic that will span 2 days. We will discuss rigging options, how-to demonstrations, and technique options accompanied by hot catered lunches right on the ice. All of the necessary tackle and gear will be provided for the seminar, as well as transportation on and off of the ice. In all, the future is bright for everything that we have to offer. With continued hard work and dedication by all of our Captains and Guides, we will continue to strive to create lasting memories and outstanding experiences for each and every one of our customers.